Students analyze a community of beans (pinto, lima, navy) to determine the richness, abundance, and biodiversity index of two communities. The communities are set up in advance, just place bags of beans into a large bowl or bucket, and then have students use a small cup to model sampling. After counting the number of each type of bean, students record data on a table and determine the relative abundance of each “species” of bean. 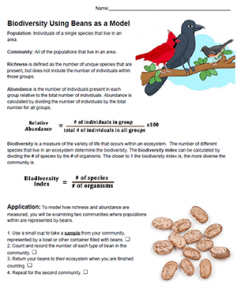 Student will then use an equation to establish the biodiversity index. Discussion questions ask students to explain why one community has a higher index than the other and to explain why different groups got different results (sampling errors). Discussion follows regarding why the biodiversity index might be important to ecologists who study forests and other ecosystems.